Heavy Duty Construction - increases reliability and safety, eliminating flexing during the critical plugging process that can cause future complications. 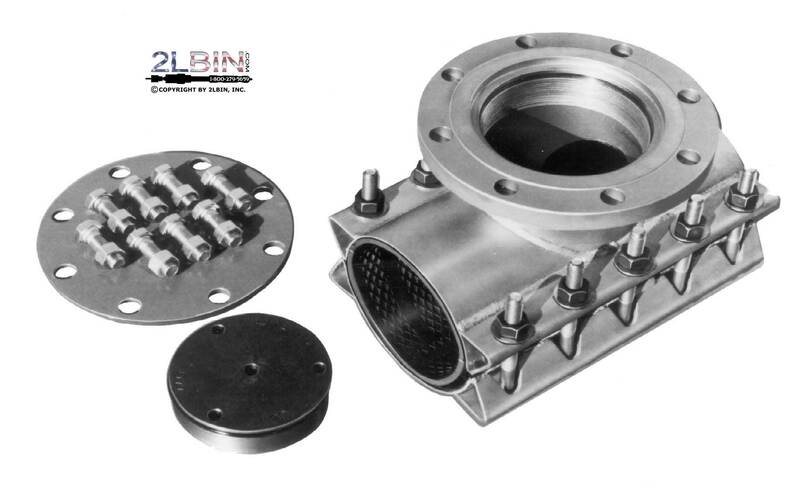 Versatile Tapping Sleeve Design - insures high gasket sealing compression for permanent service and overcomes the physical forces involved during line stopping. Also, doubles as an all stainless steel tapping sleeve in sizes 4” - 8”. All Stainless Construction on popular 4”, 6”, 8” sizes - provides corrosion resistance for long term rugged service. Test Plug Outlet - Allows for the testing of all seals prior to tapping the pressurized line. This includes the sleeve-to-pipe seal and the completion plug seal. Adapts To All Popular Line Stopping Machines - 440 Line Stop Fittings will adapt to ANY manufacturer’s plugging equipment, making the 440 versatile and convenient to utilize. Installation on 150 PSI Piping Systems - heavy duty design and materials give the standard 440 Line Stop Fitting a 150 PSI working pressure capability. This working pressure capability assures restoration to full service capacity for current and future service line requirements. Special engineered line stop fittings are available for sizes 14” and larger for various types of pipe. For information, contact our technical and engineering Sales Team. Adapter Flanges available to mate with line stop machines, please specify size and equipment manufacturer. LINE STOP PLUG: Ductile Iron A536. PLUG O-RING: Buna N Rubber COVER PLATE GASKET: Neoprene Rubber. BODY/OUTLET GASKET: SBR rubber - for use with water, salt solutions, mild acids and bases. BODY: ASTM 283 Grade C or ASTM A-36 Carbon Steel FLANGE: AWWA C207 Class D Carbon Steel ANSI 150lb Drilling, recessed for tapping valve MSS-SP60. COVER FLANGE: A-36 Cast Steel, shop coat primer or optional fusion epoxy coating to companion selected sleeve finish. BOLTS: Corrosion resistant, high strength low alloy AWWA C-111, ANSI 21.11 FINISH: Corrosion resistant shop coat primer. Optional Fusion Epoxy Coating and Stainless Steel Bolts available.